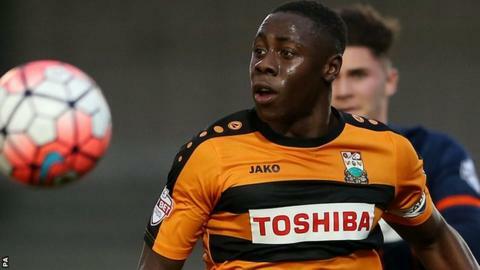 Barnet captain Andy Yiadom scored his first goal since September to beat Plymouth, who slipped to third place. There were 14 minutes added on at the end of the first half after Pilgrims defender Jordon Forster was taken off on a stretcher with a head injury. Argyle came closest before the break, Reuben Reid firing wide and James Pearson heading an effort off the line. Yiadom netted on the turn after a forceful John Akinde run, making it just one loss in eight for the Bees. Barnet remain 15th in League Two while the Pilgrims host Oxford, who leapfrogged them into second, on Saturday. Speaking after the match, Plymouth boss Derek Adams revealed first indications say Forster has a broken jaw while striker Ryan Brunt, who was also forced off, has a suspected cruciate ligament injury. "I think they played quite well in the first half and we didn't actually make our mark on the game. "At half-time I encouraged our players to show some more self-belief, a bit more tenacity and some more courage. "It was a very, very good second-half performance - I'd say up there with the best." Match ends, Barnet 1, Plymouth Argyle 0. Second Half ends, Barnet 1, Plymouth Argyle 0. Attempt saved. John Akinde (Barnet) right footed shot from outside the box is saved in the top centre of the goal. Attempt saved. James Roberts (Barnet) right footed shot from long range on the right is saved in the top left corner. Attempt saved. Peter Hartley (Plymouth Argyle) left footed shot from outside the box is saved in the centre of the goal. Substitution, Barnet. Michael Nelson replaces Luke Gambin. Attempt blocked. Kelvin Mellor (Plymouth Argyle) right footed shot from the left side of the box is blocked. Alie Sesay (Barnet) wins a free kick in the defensive half. Substitution, Plymouth Argyle. Daniel Nardiello replaces Jake Jervis. Attempt saved. Sam Muggleton (Barnet) right footed shot from outside the box is saved in the centre of the goal. Attempt missed. Craig Tanner (Plymouth Argyle) right footed shot from outside the box is close, but misses to the left. Attempt missed. Jake Jervis (Plymouth Argyle) right footed shot from outside the box misses to the left from a direct free kick. Goal! Barnet 1, Plymouth Argyle 0. Andy Yiadom (Barnet) right footed shot from the centre of the box to the bottom right corner. Assisted by John Akinde. Oscar Threlkeld (Plymouth Argyle) wins a free kick in the defensive half. Attempt saved. John Akinde (Barnet) right footed shot from very close range is saved in the top centre of the goal. Corner, Barnet. Conceded by Peter Hartley. Substitution, Barnet. James Roberts replaces Mark Randall. Corner, Barnet. Conceded by Luke McCormick. Attempt saved. Andy Yiadom (Barnet) header from the centre of the box is saved in the top left corner. Attempt saved. Craig Tanner (Plymouth Argyle) left footed shot from the centre of the box is saved in the centre of the goal. (Barnet) wins a free kick in the attacking half. Corner, Plymouth Argyle. Conceded by Luke Gambin. Attempt saved. Craig Tanner (Plymouth Argyle) left footed shot from outside the box is saved in the top centre of the goal. Substitution, Barnet. Sam Muggleton replaces Matt Stevens.